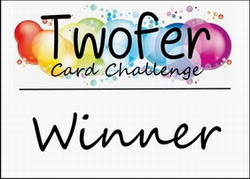 Twofer Card Challenge #8 Winners! 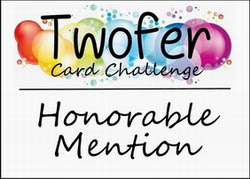 It's time to announce our Winners and Honorable Mentions for Twofer Card Challenge #8! 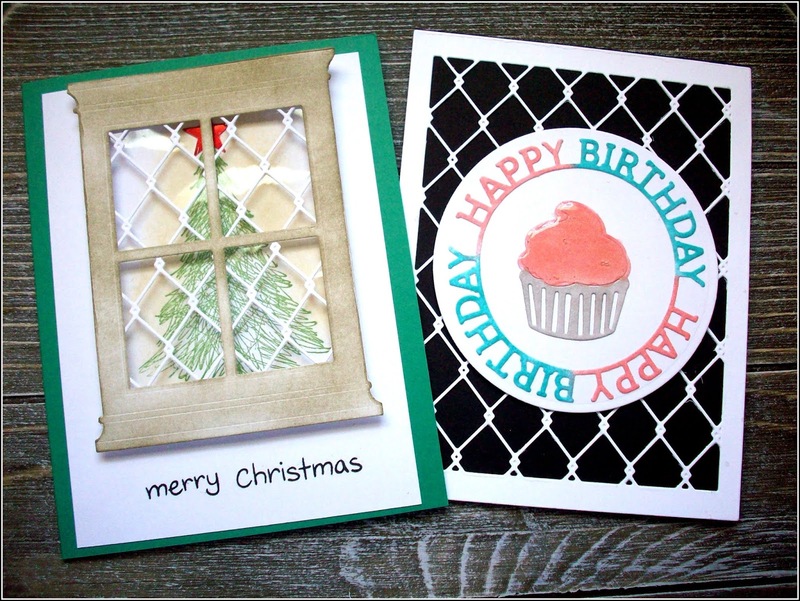 Thank you so much for your enthusiasm and your sensational card designs! You all did a wonderful job with the GEOMETRIC prompt! 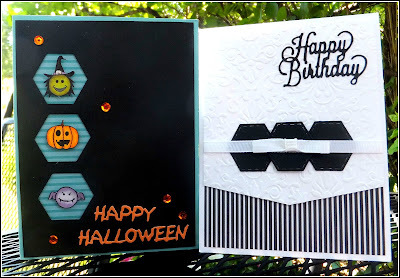 Once again, it was a lot of fun seeing the ways you stretched your stamps and dies in conventional and unconventional categories! 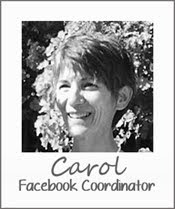 Congratulations to our August "Conventional" Winner! 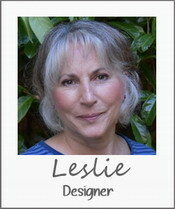 Liz took her circle die and made two distinctly different designs. 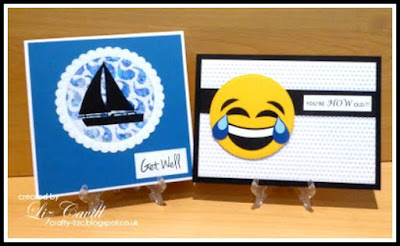 For her Get Well card, Liz's stenciled ocean wave background and scalloped frame are perfect for that silhouette sailboat and the bright blue panel really brings out all the white elements! 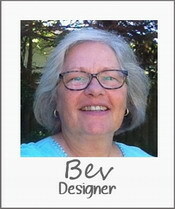 On her Birthday card, the emoticon is laughing so hard it's crying! 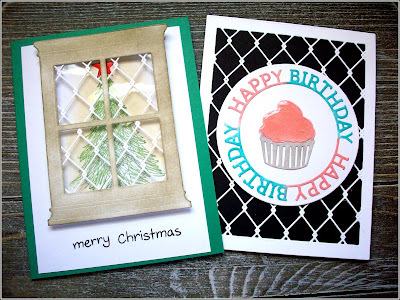 Her snarky sediment and dotty embossed panel complete the card perfectly! Congratulations to our August "Unconventional" Winner! Linby used the intricate and beautiful MFT Quilted Frame die with Brushos to make two lovely panels for her beautiful Birthday card design intended for a quilter. For her Christmas card, Linby cut out just the center star part of the die three times from a Brusho panel and displayed them as gorgeous blue snowflakes! 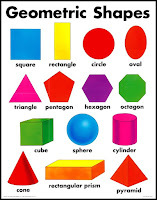 Very innovative! 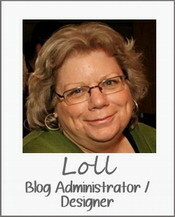 for both of you to proudly display on your blogs! 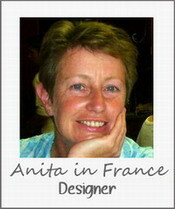 I will be in touch with details about being future Guest Designers! 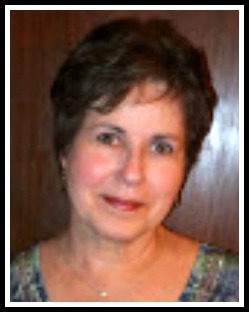 Congratulations to our fabulous August Honorable Mentions! 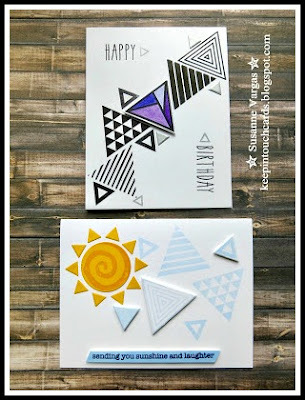 Marina used a chevron patterned triangle stamp for her two distinctly different designs. 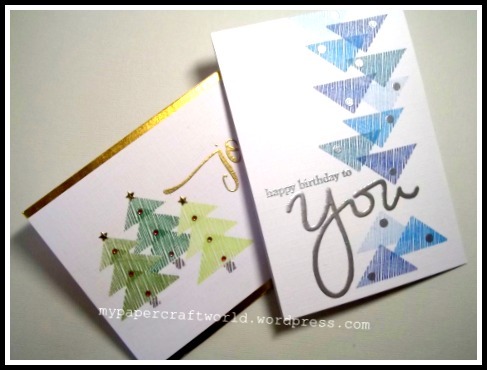 The triangle made a perfect Christmas tree in place of the letter A on her Merry Xmas card in simple forest green and white. 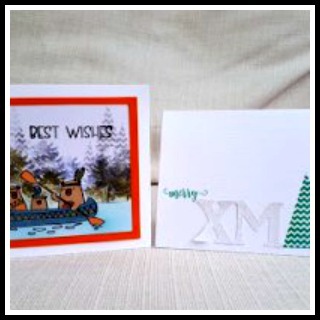 For her Best Wishes card, Marina used the same stamp very cleverly to create mountains in her darling outdoors scene where even more triangles are visible in the canoe design and Mrs. Bear's blanket wrap! Lynda's two different designs for two different occasions are simply fabulous! For her Friendship card she created a wonderful garden trellis effect with her white-embossed hexagons and beautiful frame entwined with two beautiful kinds of flowers! For her one-layer Get Well card, she used the hexagons as a honeycomb background for her brilliantly masked tray of get well potions! 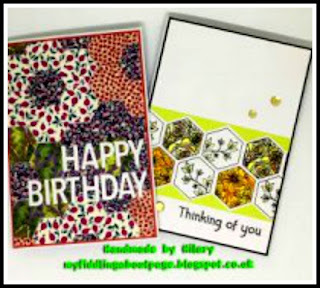 Hilary also used a hexagon shape for her prompt on both her creative designs. 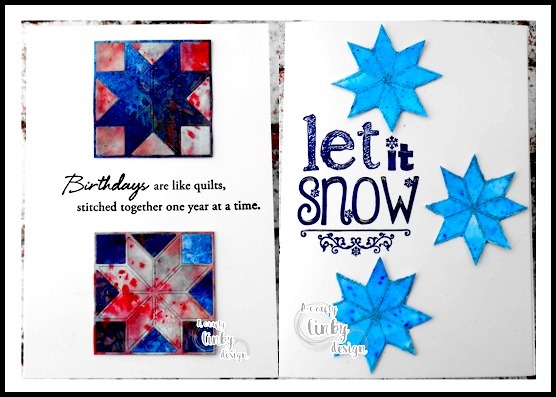 For her stunning Birthday card, she used REAL fabric to create her quilted pattern using some of her favorite fabrics! 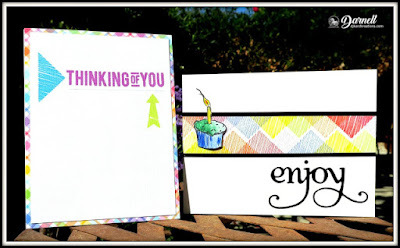 For her Thinking of You card, Hilary used her die as a stamp to create her hexagon panel. 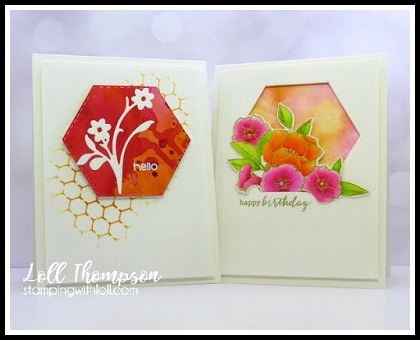 She then masked, inked, stamped, and colored the panel to create individual hexagon-framed florals! 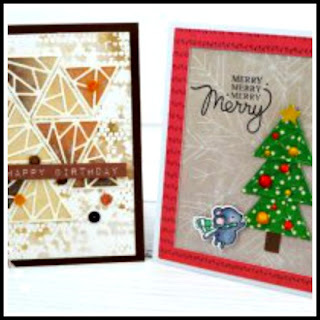 Nora used triangles for her prompt on her Birthday and Christmas cards, making two different designs. 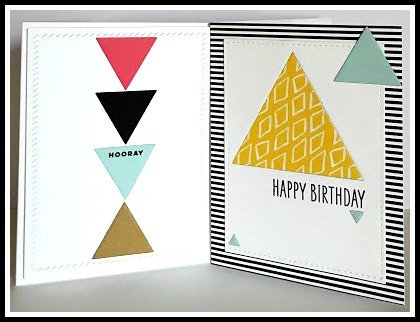 Her Birthday card design is a mixed media masterpiece, created by layering stencil monoprint and sponged shattered die-cut triangles in warm neutral colors! For her second card, Nora made a Christmas tree with her triangles backed by a beautiful design and framed in bright red. 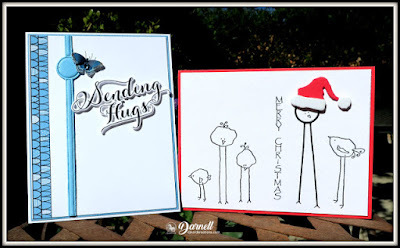 She finished her card by adding an adorable mouse reaching for one of those bright ornaments! 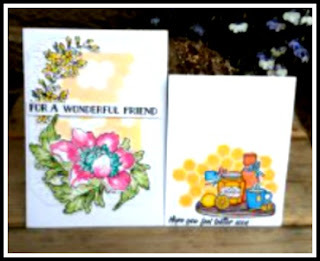 Marianne made two super cute but completely different designs using circles as her Geometric prompt! 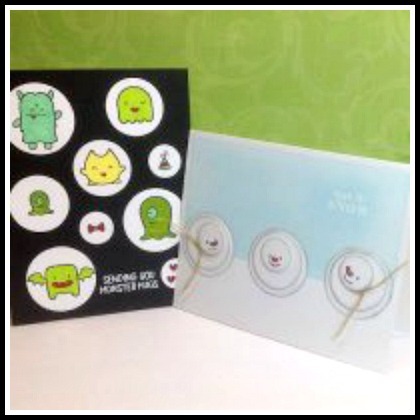 She filled her first card with many circle-framed and colorful monsters sending monster hugs to the recipient. They really pop against the black card base! And then she made the most adorable overhead view of three snowmen with the coolest detailed faces and scarves! 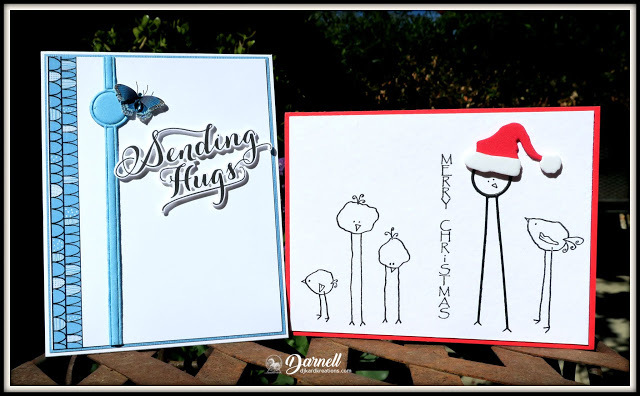 Her background sky of brushed blue and her white heat-embossed sentiment are soft, allowing the snowmen to take center stage! 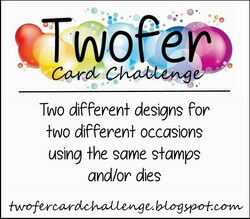 We look forward to seeing your creative and awesome Twofer Card Challenge designs next month! The challenge will run from September 10 to September 24, 2018. THANK YOU for your amazing entries so far in this month's challenge! 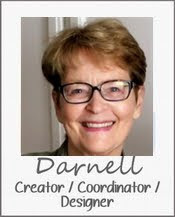 We are enjoying your wonderful creations! There is still time to play or play again! 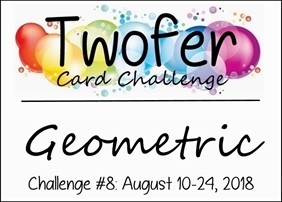 The challenge is open until the end of day on August 24th! My geometric stamp is a sketchy triangle from PTI, used singly on my thinking of you card and in a colorful pattern on my birthday card. 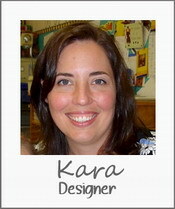 For details, please click over to my blog, djkardkreations. 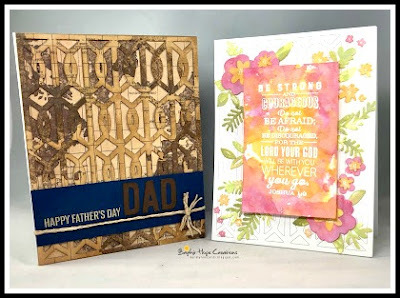 Remember, too, that we will have a "conventional" challenge winner from those who use their geometric stamp or die traditionally and, if suitable, we will also have an "unconventional" winner from those who use their geometric stamp or die as something nontraditional! This month we are delighted to have both a conventional winner and an unconventional winner from our June challenge as our Guest Designers! The challenge is open until 11:55 PM (PST) August 24th. 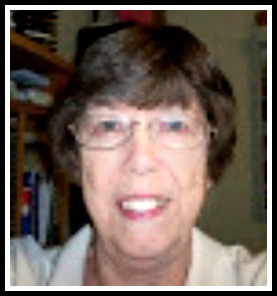 at 12:05 AM (PST) August 30th.